Derale Universal Oil Cooler - Remote Mount UNIVERSAL - Dezod Motorsports Inc - Home of the automotive performance enthusiast since 2002. With its own air supply, this popular Atomic-Cool Remote Oil Cooler can literally be mounted almost anywhere, making it a popular addition for performance cars, hot rods, muscle cars and trucks. A heavy duty plate and fin cooler coupled with a Tornado fan and aluminum brackets, this universal kit comes with a complete installation kit to install easily on most vehicle engines. The compact yet powerful Hyper-Cool Dual Cool Remote Cooler adds a great deal of flexibility and cooling options to enthusiasts everywhere. This efficient little workhorse is perfect for engine, transmission or power steering needs. Utilizing a high-performance Stack Plate Cooler with integrated turbulators and airflow supplied by waterproof/dustproof electric fans, it can literally be mounted anywhere space permits. Add the clever anodized aluminum dual shroud that doubles as the mounting bracket, this cooler is equally efficient regardless of orientation. It can be mounted upside down, vertically, horizontally or diagonally, and that flexibility makes it truly unique in the remote cooler category. Every kit includes two -6AN male fittings, two 1/2” barb fittings. The Dyno-Cool Universal Remote Cooler can be mounted anywhere space permits, using a highly efficient copper tube/aluminum fin cooler and a curved blade fan to provide airflow and extend transmission life. Perfect for medium duty use. Mounting kit not included. 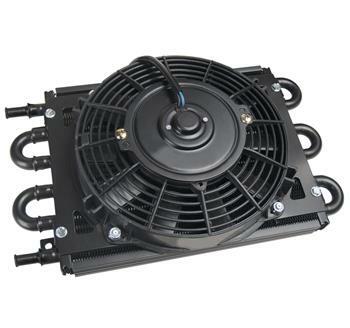 With an efficient copper tube/aluminum cooling fin cooler being supplied air by a Tornado electric fan, this value priced remote cooler comes with hose barb inlets and is recommended for light duty towing and hauling or when pulling consistent grades. A great addition to compact cars and smaller SUVs that will add years to the life of a transmission at a reasonable price. Also recommended for power steering and fuel cooling. No mounting hardware included. Made in USA. Combining an efficient 4 & 4 or 8 & 8 Pass copper/aluminum cooler core with a powerful Tornado electric fan, this compact remote cooler cools two separate systems with one compact design that can be mounted literally anywhere space permits. Includes clear anodized aluminum mounting brackets, brass hose barb fittings to adapt to a wide variety of heat removal requirements.